When visiting Northern New Mexico, ask any of the locals you run into as you’re wandering around the eclectic shops, museums and art galleries in Taos about the must place to eat in town and you’ll get a unanimous “You’ve got to go to Michael’s”. This laid-back restaurant has been a landmark for both locals and tourists alike for over four decades and now their new website with a Shop & Ship feature and all new gift certificates makes it easier for everyone to enjoy. The newly redone Michael's Kitchen Restaurant & Bakery famous sign. “You’ve got to go to Michael’s” is what you'll hear when asking where to eat in Taos, New Mexico. “Originally built in the 1940’s, our existing building was once named Spivey's but on February 1, 1974, that all changed” said Michael, the original owner. He decided to uproot his family in California and purchase a restaurant in this tiny northern New Mexico town. Shortly thereafter the Fiesta Bakery located only two blocks away was purchased and Michael’s Kitchen Restaurant & Bakery was officially launched. Taos, located in a tributary valley off the Rio Grande, is known worldwide for the Taos Pueblo, a World Heritage Site which borders the town on its north side. It is considered to be one of the oldest continuously inhabited communities in the United States. The town was established c. 1615 by Don Fernando de Taos, following the Spanish conquest of the Indian Pueblo villages. Beginning in 1899, artists began to settle in this area and the famous Taos art colony developed. Many paintings were made of local scenes, especially of the Taos Pueblo, its people and the various ceremonies that take place there. Some of these artists include Ernest L. Blumenschein, Eanger Irving Couse, Joseph Henry Sharp and Nicolai Fechin, all of which are listed in the National Register of Historic Places. Other influential 20th-century Taos artists followed including R. C. Gorman and Agnes Martin. It took Michael nearly three years of fine tuning the recipes and getting the menu where it needed to be to meet the demands of this diverse group of local Taoseños, Hispanics, Native Americans and Artists. He applied some creative artistry of his own to the menu but the results speak for themselves. The word spread and Michael’s Kitchen Restaurant & Bakery became a hit for both locals and tourists. Gina, one of Michael and Pat’s daughters, and her fiancé Derek decided to relocate and marry in Taos after graduating from New Mexico State University. About this time Michael and Pat began thinking about selling the business and slowing down, so after Gina and Derek Apodaca married in 1997, the young couple decided to dive in and learn the restaurant business from the bottom up with the ultimate goal of ownership. The learning curve was no easy task and the training in all aspects of becoming a restauranteur was intense for the young couple but on January 1, 2005 the actual transfer of ownership became official. “We kept the purchase a secret for the first six months from our employees. Only our accountant and a handful of family members knew. Why, you ask? We did not want anyone to think that things were going to change -- and they didn't”, said Derek. This was the deciding factor in keeping the name and tradition that had been so well developed and maintained. This is also why they kept the old pot belly stove that many thousands of diners have been photographed with. When they recently updated their famous sign with the stove depicted on it, they went through great pains to make sure it retained the original look. All the pastries, English muffins, raisin, rye, sourdough or wheat bread, doughnuts and cinnamon rolls are created in the downstairs bakery that produces up to 175 different items, depending on the season. You can’t resist taking home some of their cream-filled long johns, cupcakes, éclairs, empanadas, pinecone rolls, scones, cream puffs or French crullers. 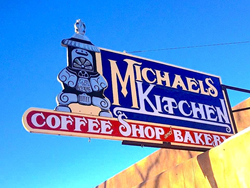 Michael’s Kitchen offers a perfect blend of authentic Northern New Mexico chile dishes and good old American standards to please locals and tourists alike. “Fifty gallons of our trademarked red and green chile is made every day. On weekends we go through about 330 dozen eggs preparing our popular breakfast dishes including bacon and eggs, huevos rancheros, omelet extraordinaire, strawberry waffles, atole-piñon pancakes, breakfast enchiladas and our poor man’s eggs benedict smothered with red, green or veggie-green chile” says Gina. Some of the more popular lunch items include our daily specials for only $7.25 or how about a veggie omelet, a Chalupita or a guacamole salad. Derek’s lunch is a Taos-styled cheese steak with diced green chile and let’s not leave out the famous Belly Buster. It’s a double decker hamburger piled high with double cheese, double bacon, diced green chile, avocado and all the fixin’s. We dare you to finish this one with no help from your friends. Gina closed by saying, “Our recently re-designed website (http://www.michaelskitchen.com) provides an opportunity to learn more about the restaurant with menus, bakery, catering and a new shop and ship on-line ordering section and all new gift certificates. Our all new Facebook page, which recently exceeded 5,000 fans, gives you an opportunity to make suggestions and tell us your personal Michael’s Kitchen story. Who knows, you may even have the same server you had even if the last time you dined with us was many years ago”!